Lady Skywriter: Come Fly With Me! Lady Skywriter: Come Fly With Me! 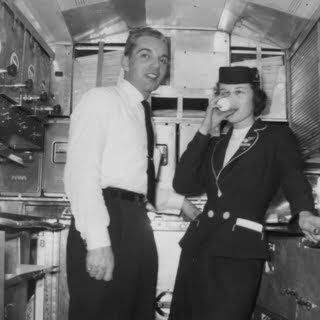 I took this photo of Bob Reardon and Bonnie Murray 50 years ago, in a Stratocruiser galley. In 2008, American Express Departures magazine published a wonderful piece about six veteran cabin attendants, most with 50 or more years of service and still flying! I own a copy of the magazine, but had completely forgotten about it. A retired flight attendant friend, Mary Pat Laffey Inman, just sent me the link below, today. Some things have staying power, it seems. I'm glad it is still circulating in cyberspace. Give it a click - you'll enjoy reading what each of these "old timers" had to say. And I especially love it because it features my NWA Boeing Stratocruiser working partner from the 1950s, Bob Reardon. Bob is a legend in his own time - I know from first-hand knowledge that he is still flying in 2010, at 85 years young, although the airplanes he works on today say Delta, instead of Northwest. I'd love to know the current status of the others in the article. Thanks, Mary Pat, for reminding me of this great piece.